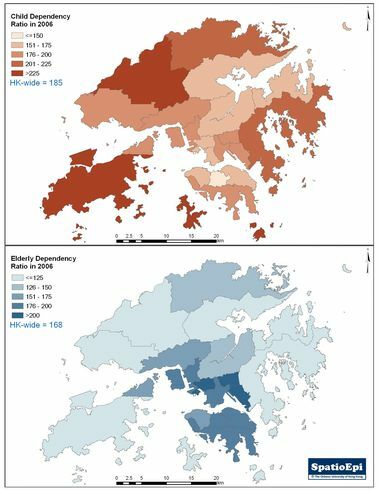 The map shows the variation of Child Dependency Ratio and Elderly Dependency Ratio across 18 districts in Hong Kong for the year 2006. These ratios indicate the theoretical fraction of population which are ‘dependent’ on the adult working population. Normally this would mean either young children or elderly. Elderly Dependency ratio is generally lower than Child Dependency Ratio. Interestingly, districts with a higher Child Dependency Ratio tend to have a lower Elderly Dependency ratio and vice versa. Data were obtained from the 2006 Population By-census through the Census and Statistics Department. Child Dependency Ratio is the number of persons aged under 15 per 1 000 persons aged between 15 and 64. The ratio is a measure of the number of young people who are fed by the working population. This is affected by factors like birth rate. Elderly Dependency Ratio is the number of persons aged 65 and over per 1 000 persons aged between 15 and 64. The ratio is a a measure of the number of elderly people fed by the working population. 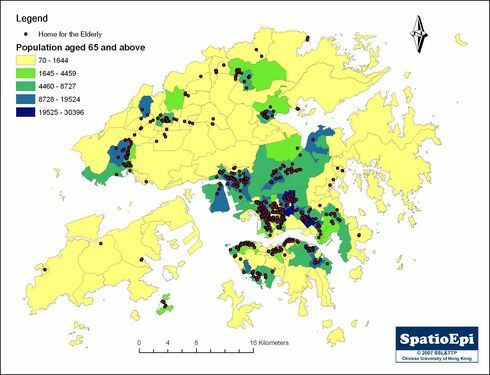 Fluctuation of the ratio is associated with the ageing problem in Hong Kong.